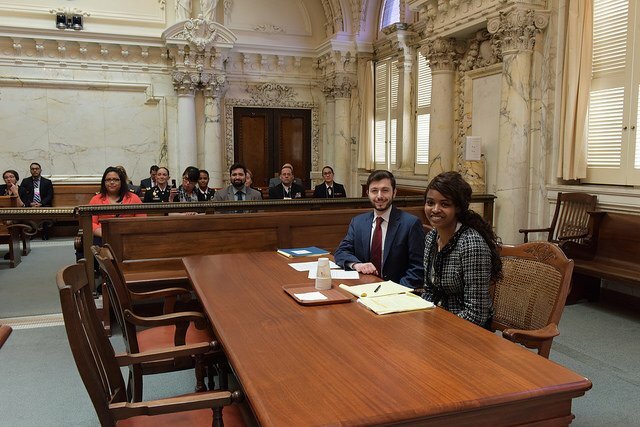 The Annual Uvaldo Herrera National Moot Court Competition brings together 32 teams of law students from the nation’s top law schools to argue a case of first impression that will effectively challenge students and allow them the opportunity to argue and brief either position creatively and persuasively. This year, the competition will take place at the Albuquerque Convention Center during the 2019 Corporate Counsel Conference. The HNBA will be setting aside a block of rooms for students at a reduced rate. Please contact Carla Martin, HNBA Director of Programs, at cmartin@hnba.com with any questions. All team members must be members of the HNBA and the HNBA Law Student Division in order to compete in the HNBA’s Moot Court Competition. If you are not a member, please click here to sign up. The cost to participate in the Moot Court Competition is $650 for a team of up to four individuals (including a coach/advisor). The team registration includes access to the Moot Court Competition and Gala ONLY. Plenaries, receptions, and other evening activities are not included in the standard Moot Court Competition team registration. If individual team members wish to attend all other Conference-related events, each team member must purchase a Moot Court Team Plus Registration. Upon submission and acceptance, your team contact will receive additional details. If you have any questions, please contact Carla Martin, HNBA Director of Programs, at cmartin@hnba.com. Current Schedule as of 10/20/18. This schedule is subject to change. Thank you to the law firm of Gibson Dunn & Crutcher for selecting the problem and formulating it for the student competitors. Also thank you to Gibson Dunn, and Elizabeth Vadakara, Esq. (Law Clerk to Judge Leonardo Castro) for preparing the bench memo for the competition judges. Question: If a school is able to send two teams, are they allowed to share a coach? Question: If a school has two teams, can they practice together? Answer: The teams can practice together. However, they are not permitted to begin practicing until both teams have submitted their final briefs. The rules do not permit any assistance with writing the briefs and this will ensure that there is no inadvertent swapping of arguments, ideas, information, cases, etc., that may be used in the written brief. Question: Can you clarify the rule for brief submission regarding fonts? Answer: The rule has been amended to require that all briefs must be typed using Courier New Font. The type size 12 point will remain the same. Failure to comply with this amendment will result in a deduction of points from the team’s final brief score, as determined by the DSB.